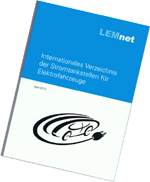 The list of all sites of charging facilities for electric vehicles LEMnet (www.lemnet.org) is a project that has been online since 1997. LEMnet is sponsored by Park & Charge, but takes up all providers of charging stations. The entry is without fee. At least every two years the list is published as a printed book. The last edition was published in March 2010. In every edition a new main sponsor of the first and last page is welcome (see figure 1).